Buying dividend stocks? Don't make this mistake. Investment mistakes can sometimes sneak up on even the most experienced investors. And with so many potential pitfalls, it's hard to know where to look for risk. One mistake I see people make far too often today is to buy high-yield dividend stocks, assuming that dividends are set in stone. This couldn't be further from the truth. Buying a high yield may in fact be a recipe for disaster. A dividend at its core is simply a company paying owners a financial return from some of the money it makes on operations. If operations generate more cash, the payout will go up long term, but if operations lose money, we can see once-attractive dividends dry up. So, chasing yield can be a huge mistake. The best example of late are offshore drilling companies that were once strong dividend stocks. Seadrill (NYSE:SDRL), Transocean (NYSE:RIG), and Ocean Rig UDW (NASDAQ:ORIG) once looked like extremely attractive dividend yields on a trailing basis, and with billions in contracted cash flows, the payout seemed to be all but guaranteed for years to come. But then the oil markets fell apart and offshore drilling went into free fall. Many companies cut dividends to save cash, but up until a few months ago, Transocean and Ocean Rig UDW were still doling out attractive payouts that may have made the stock look tempting as a dividend stock. But that wouldn't last through declining operations. 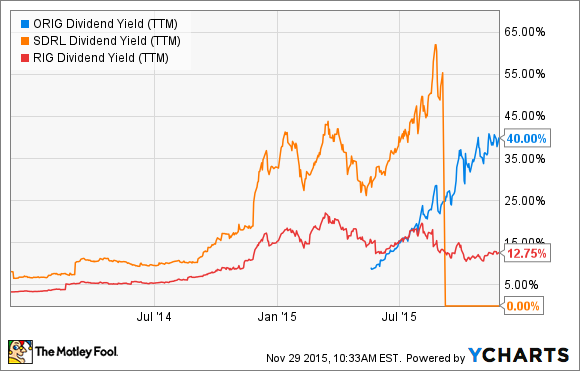 ORIG Dividend Yield (TTM) data by YCharts. Today, all three companies have suspended their dividends and once-lofty yields are now 0%. Investors who thought they were buying high-yield dividend stocks are now holding companies just trying to survive, much less pay a dividend. To avoid getting sucked into dividends that are too good to be true, there are two main factors to look for: the payout ratio and the durability of the company's business model. Payout ratio is the dividend payment divided by net income or free cash flow each year. A low payout ratio means there's leeway for operational disruption and even the ability to raise the dividend in the future. Think of it as a measure of safety. Durability and diversity of a company's business model will give investors an idea of the risk associated with its dividend. In the case of Seadrill, Transocean, and Ocean Rig, they're all heavily tied to oil prices, so when oil dropped demand dried up, so did profits. That forced the suspension of dividends. A more diverse energy company, like ExxonMobil (NYSE:XOM), may be negatively affected by falling oil prices, but it makes up for it with money made in other parts of the business, like refining or marketing gasoline. The difference is evident in ExxonMobil's dividend rising 6% in the third quarter to $0.73 per share compared to the three drilling companies all cutting their dividends to zero by then. The more diverse the business and the more durable its competitive advantage, the more likely a dividend is safe to investors. When researching stocks, it's hard not to like a stock that looks like it has a high dividend yield. But a high yield can actually be a bad omen for stocks, indicating that investors are seeing more trouble ahead than the payout indicates. To avoid the mistake of chasing yield and assuming a dividend is safe for the long run, take a look at a company's payout ratio and long-term durability. Dividends may not be as safe as they once appeared.